Be the first to share your favorite memory, photo or story of Victoria . This memorial page is dedicated for family, friends and future generations to celebrate the life of their loved one. Victoria “Vicki” Hehn was born June 20, 1957, to Stanley and Helen (nee Spela) Mazurek. She died April 15, 2019, in Park Ridge. 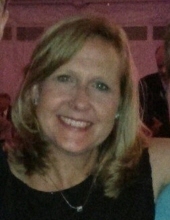 Mrs. Hehn worked as an administrative assistant for McArthur Elementary School in Prospect Heights for over 15 years. Victoria was a member of St. Edna’s Catholic Church in Arlington Heights. She loved to spend time with her family and was loved by all. She is survived by her husband of 37 years, Guenther, whom she married August 1, 1981, in Chicago; children, Matthew (Therese) Hehn and Daniel (Alexius) Hehn; brother Robert Mazurek; and nieces Vanessa Mazurek and Brittany Mazurek. Victoria is preceded into death by her parents; and brother Steven Mazurek. Visitation Tuesday, April 16, 2019 from 4:00 pm until 8:00 pm at Glueckert Funeral Home, Ltd., 1520 North Arlington Heights Road (4 blocks south of Palatine Road), Arlington Heights, IL 60004 and Wednesday, April 17, 2019 at Edna Catholic Church, 2525 North Arlington Heights Road, Arlington Heights, IL 60004 from 9:00 am until time of Mass at 10:00 am. In lieu of flowers, memorials may be given to St. Edna Catholic Church, 2525 North Arlington Heights Road, Arlington Heights, IL 60004. "Email Address" would like to share the life celebration of Victoria "Vicki" Hehn. Click on the "link" to go to share a favorite memory or leave a condolence message for the family.